Gimbals are awesome! They allow you to get really nice cinematic footage with your GoPro cameras and even though the new Hero7 already has a very decent image stabiliszation built in there`s no replacement to the smoooth motion of a good gimbal. So far I have been a HUGE fan of Feiyu Tech G5 and G6 but Freevision VILTA-G has some serious advantages that make this a top contender. The Freevision VILTA-G comes in a nice compact cardboard box and inside ou will find the gimbal nicely tucked in the carry case. Jumping the gun a bit I think the carry case is so far THE BEST I have seen. It`s a hard case to offer protection to the gimbal and it`s just the right size to fit the gimbal without any excess wasted space to make it too bulky. Compared to the case of the Feiyu Tech G6 the Vilta-G case is PERFECT. The G6 case doesnt even fit in my day backpack so its only good for me to storre the gimbal and thats not the point. 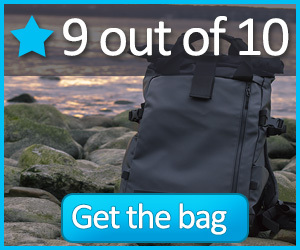 Vilta-G case fits nicely in even smaller bags so its perfect to take with your for your travels. 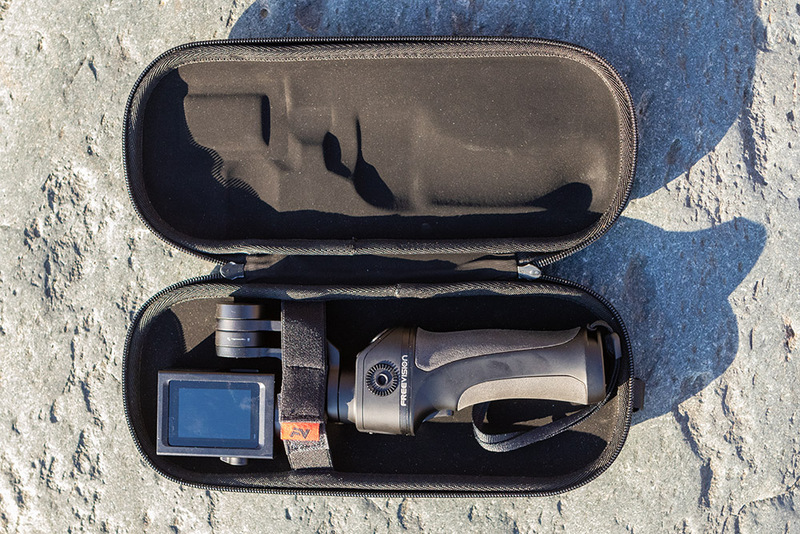 The case is lined with smooth felt-like material and a velcro bungee to secure the gimbal inside. The case also has a wrist loop (not detachable) and metal loops to attach a longer shoulder strap (Included in the box). Its a two-in-one gimbal. 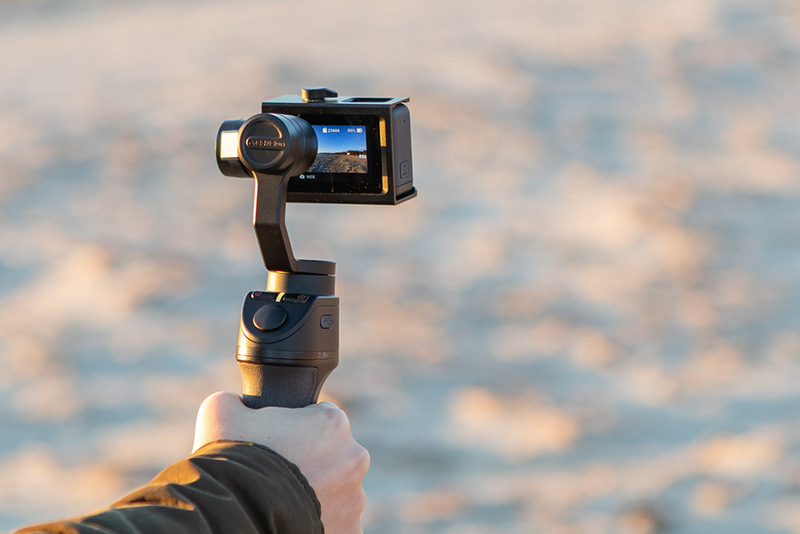 You can use it as a regular handheld gimbal or you can transform it into a wearable gimbal. It has the best and the fastest camera attachment system I have ever tried. Out of the box the gimbal looks like any other gimbal with a handle. But if you press a button on the sidemarked “Push” you can detach the top part and you will have a small wearable gimbal. 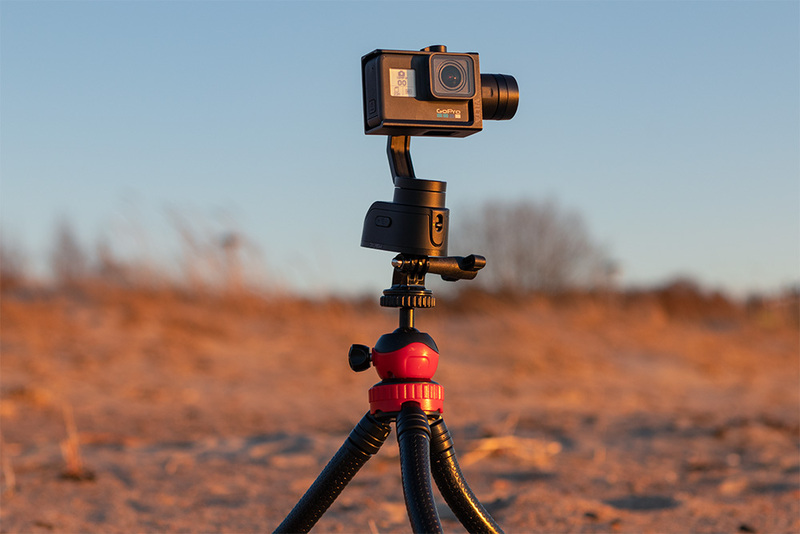 At the base of the wearable part, you have two standard tripod screw mounts, one on the side and one at the bottom and GoPro mount plates that fold out of the base. The Wearable part also has the charging port covered with a rubber seal so you can charge the handle and the wearable part separately. The handle also has a charging port that you can only access when the top part is detached. When the gimbal is in one piece the rubber covered port charges both the top and the bottom. The wearable part features a 350 mAh battery and the handle packs a solid 2000 mAh battery for longer use. 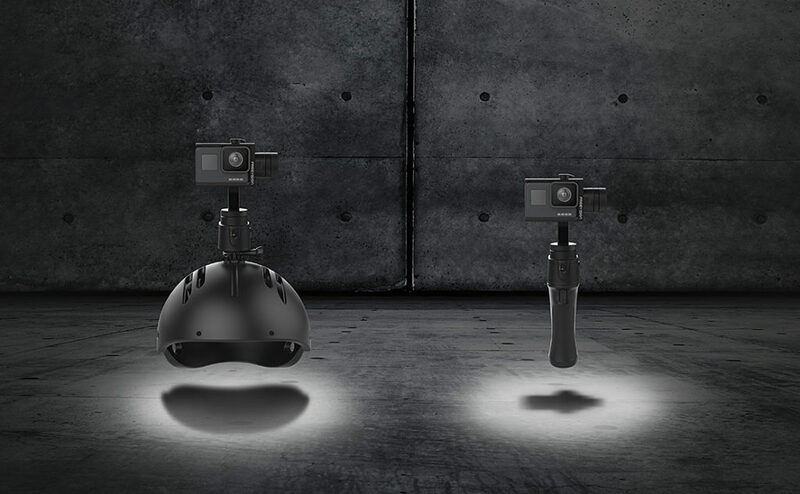 The werable part also has the motor lock button that let`s you lock the gimbal panning motor. Locking the Yaw and pitch motors is done by pushing the motors just a bit further from their natural movement range. With all motors locked the Freevision VILTA-G is perfectly aligned and safe to store away in the case. Make sure to unlock all the motors before turning the gimbal on! Reattaching the two parts is as easy as detaching and takes a second. Just align the two parts and slide a few millimeters until you hear a click. 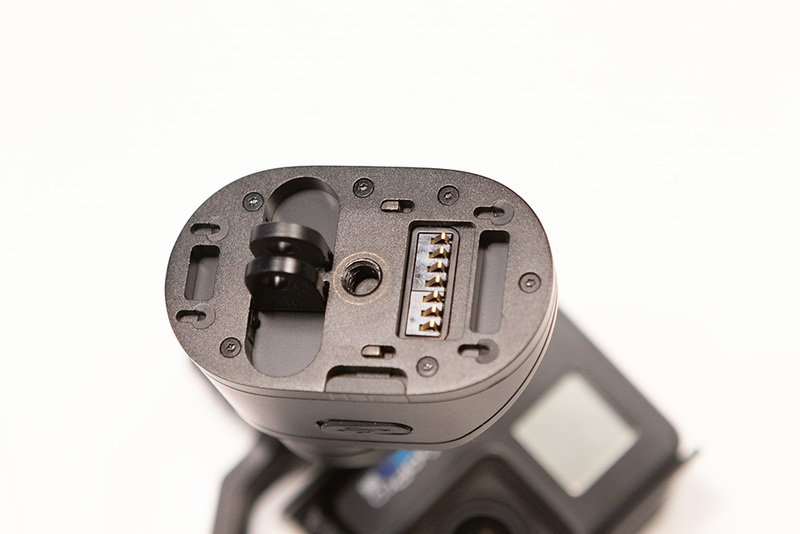 Most gimbals use the metal bracket and screws method to attach the GoPro to the gimbal. It works but its incredibly fiddly, takes so much time and is really annoying if if you are outside and your finders are stiff from the cold weather. I especially had a beef with the HOHEM XG1 gimbal that came with extra long screws that took twise as long to unscrew and then screw back once the camera was in place. 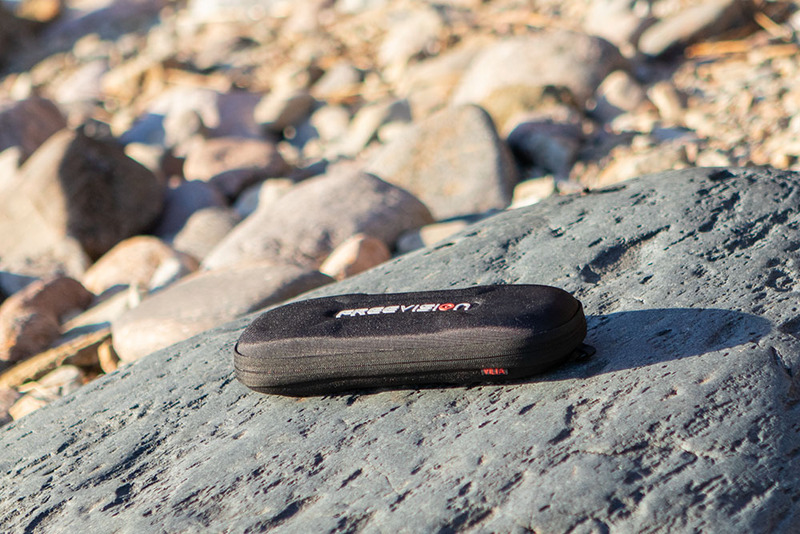 Freevision has a completely different approach to the camera attachment and its 100 times faster and more convenient. All you need to do is slide the Gopro inside the camera frame and turn the locking knob on top to secure the camere. It literally takes a few seconds to mount the camera instead of playing around with the screws for ever. 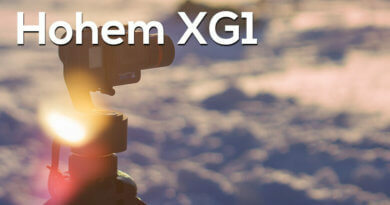 It`s so freaking easy and I dont know why other gimbals have not adopted this feature. 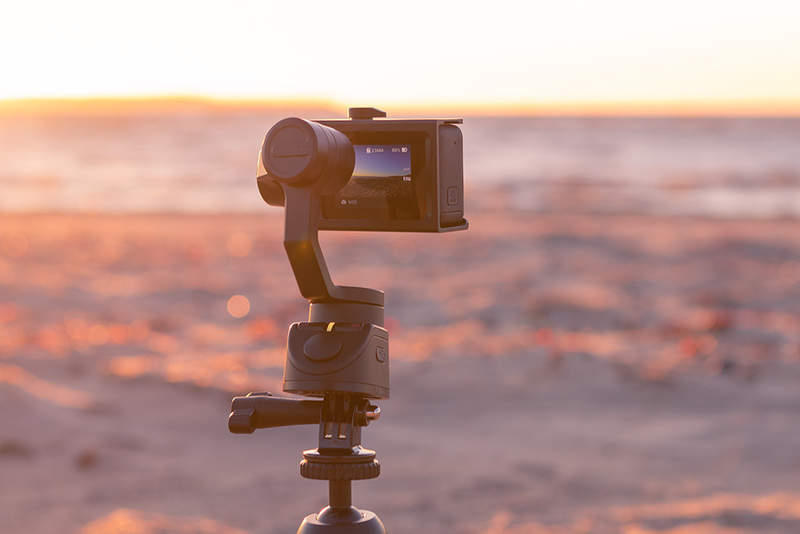 Granted, it has some limitations – to switch between different cameras, to Hero4 for example, you need an adapter (provided) but most of the times you only use one Gopro in your gimbal. Looking at the specs the one thing that is sticks out is that the roll angle is pretty limited. You can feel the limitation while using the gimbal and you need to get used to it. moving your hand side to side you will at first bump into this limitation as the camera will roll if you don`t keep the handle up in certain range. The gimbal will control the movement just before the physical limitation comes into play so the movement initiation is relatively smooth. 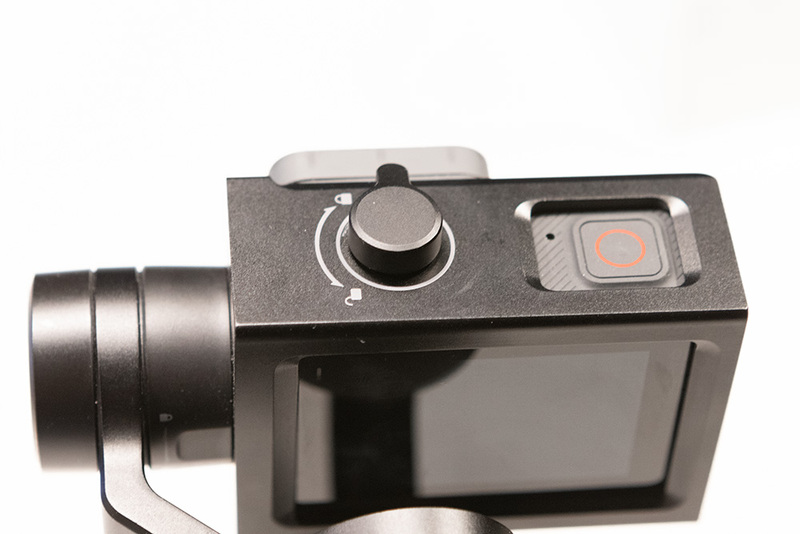 This is a better solution that what you find on the RedFox SP1 where the camera actually collides with the gimbal when you reach the roll angle limitation. So the roll angle mostly but also tilt angle limitations are the only most notable drawback with this gimbal. You can get used to it and work around them but comparing side to side with some of the popular gimbals the Freevision VILTA-G falls behind. You can also charge your GoPro from the gimbal if you need but you have to get a separate adapter for this. 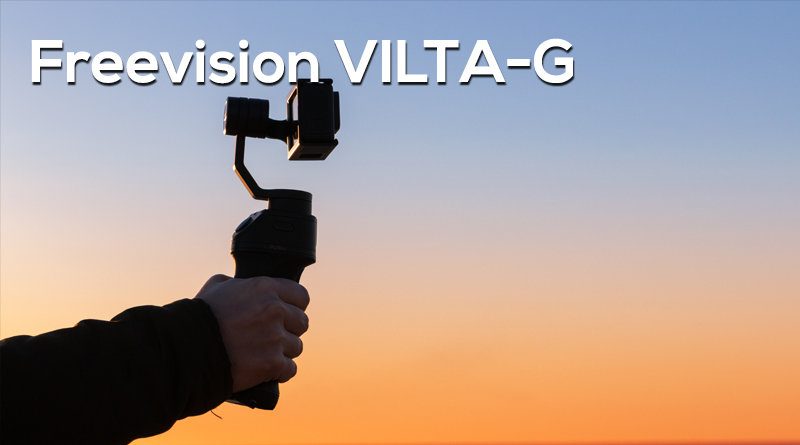 The Vilta-G is not your typical straight stick gimbal but is designed to be a lot more ergonomic and feels much more comfortable in the hand. It feels more like a pistol grip – it`s slightly curved, is a bit flattened, has really nice rubber padding and most noticeably has a trigger button where you would find a trigger on a pistol grip. It feels extremely nice in your hand and Ill give maximum points for the comfort. At the bottom of the handle features the standard tripod mount and a loop for a wrist lanyard (provided). (Default) Tilt and Roll Axes are locked. Double tap Follow Mode Roll Axis is locked. Mode Tilt, Roll, and Pan Axes are locked. The controls are pretty simple and follow the same logic as all the other gimbals. You have a power on/off button and switching between different modes is a matter of single, double, triple or quadruple taps. 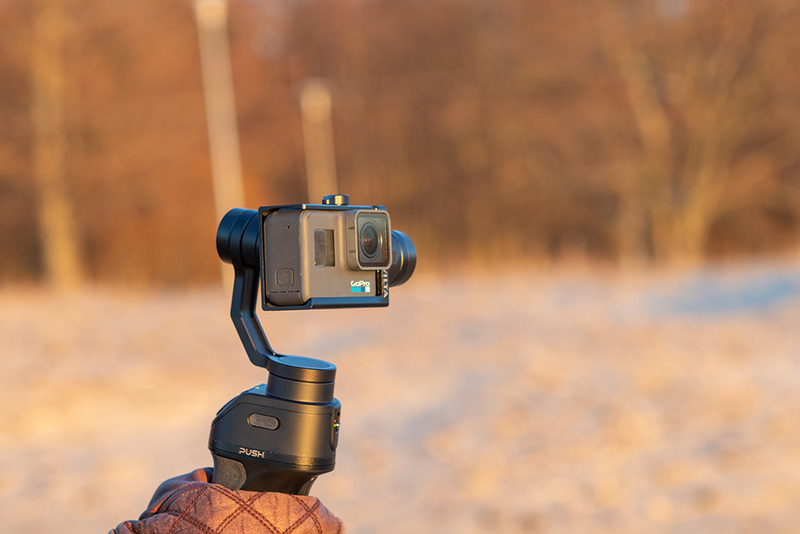 The Shutter button can be used to change the modes when the gimbal is connected to your GoPro. The Function button or the trigger button is very well placed and I find it a lot better to use than the traditional way of having the main button under your thumb. But that`s mostly a personal preference. The Stepless joystick is very nice and responsive and feels really solid. You can change the speed of the joystick in the Freevision app. Get the Freevision App from the iTunes or Google Play. Check battery status and health. 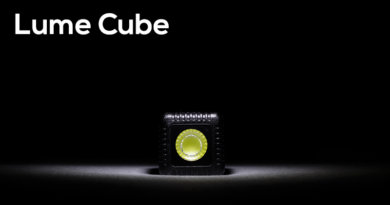 The app is pretty intuitive and fairly easy to connect to your GoPro. Just hold the Shutter button for about 6 seconds until the LED indicator turns green and you should see the Freevision WiFi network that you need to connect to. Navigation in the app is easy and the remote control works like a charm. The good thing is that you can pan in the app pretty well without accidentally tilting and vice versa. Some gimbal apps are really annoying in that sense because they require ultra precise movements in the app interface. The coolest thing I noticed that other gimbal apps don’t have is the battery health indicator- you have an exact overview of not only how full your two batteries are but you can keep your eye on the overall battery health. The second great thing is that you basically get TWO gimbals: the standard handheld and a wearable gimbal. Both parts have separate batteries and you can charge the gimbal in one piece (charges both batteries) or you can charge them separately. I also think the carry case is one of the best you can get- it`s not too big like you have with the Feiyu Tech G5 or it`s not too small like on the G5. It’s tough enough to keep the gimbal protected and fits in your backpack with no issues. The downside is the relatively limited Roll angle that kind of threw me off at first but once you get used to it it`s not terribly bad. But still something you really need to consider.